Catching snowflakes with the tongue surely is an art and apparently a most wonderful experience; some drop on your nose and provoke a tiny cool shiver, some fall into your eyes, melting and transforming into tears of joy. It has been almost an hour now since it started snowing and he still is not tired of this game. All excited he is running back and forth, head in the air, tongue sticking out - and I cannot stop watching him, his felicity is contagious. It is his first snow. So many things are new to him, there are so many first-time-experiences and I marvel how he approaches all with such curiosity, finding delight in anything, truly enjoying life. During Christmas season friends came to visit and we showed them around our medieval hilltop town in all its festive glory. One of the Piazzas had been transformed into Santa’s Christmas Village with workshops for the elves, Santa’s living quarters and Santa’s animals - a goat and a little piglet. The piglet was sitting fenced in into a corner, all afraid and depressed, I felt terrible for him, I love animals, the thought of a sentient being used purely as embellishment, was lacking any dignity and respect. The thought that animals need to be of use, is foreign to me. However, especially when you think of pigs, their sole purpose is to be killed and eaten. Eventually, that was to be the fate of the little piglet as well. But one cannot save all the animals in the world, one cannot set right all the injustice that is being done… these thoughts in mind I escaped Santa’s Village and felt like a coward. 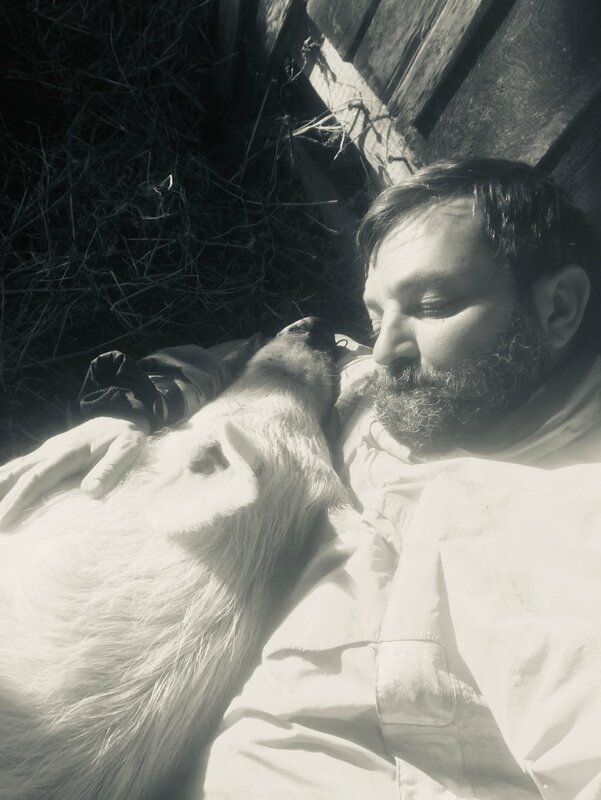 The piglet had somehow connected with me, not only did I look into his eyes, it was something deeper, a moment where I felt his need for love and protection. Eyes, ears and heart shut, I left, telling myself that I had far too many animals already. The sun has grown stronger, leaning against the wall of the wooden stable, protected from the cold wind, its rays warm the body, a harbinger of Spring. Achille is dreaming, sleeping in my arms. His snout is twitching, the hooves are moving as if ready to run, the dream seems to be a happy one. He loves his siesta, but is in pure bliss when somebody is with him, close body contact, just like he enjoyed when he was still with his brothers and sisters. They only had each other, as they were taken away from their mother when only a few weeks old. She was a loving, caring sow, but was not allowed to care for her litter, as yet again she was being prepared to produce another litter. Basically she was forced to bear little ones all year round. Less than two weeks had passed since I had encountered the little piglet, Christmas was over and we attended a birthday party of a friend of ours. Somehow the talk suddenly was about the little piglet, and I got to know that there was no other future for him other than to be slaughtered. Like a sudden insight I realised that actually I had made up my mind already the first time I saw that little porker, I was going to safe hime, love him, give him a home. Trust is a gift, nobody can demand it, it is a generous and precious present coming directly from the heart. Achille amazes me how readily he showers me with it. He loves to learn new things, if afraid at first, he quickly overcomes his fears if one is close to him. Within 10 minutes he learned to sit and wait, less than five minutes to get used to the collar and leash, in fact he loves to go for walks in the forest. Together with the dogs, he got friendly with them in no time, we go on long hikes. Not unlike a little child, well, Achille is still a child, even if 180 pounds by now, he runs back and forth on these hikes, doubles or even triples the distances we walk. And again not unlike a little child he is always so overexcited when we return home, that he does not want to crawl into his nest of straw for a rest, pretends he is fine, could easily go on yet another hike. However, it hardly takes five minutes and he is fast asleep. I sit next to him then and marvel at the beauty of this creature. And as hard as I try not to think of what should have become of him, his original manmade purpose, I cannot get it out of my head. But he is fast asleep now, feeling safe and loved. On the 31st of December I drove to the farmer who raised the piglet. He is living on a little farm on the outskirts of town, together with his mother and hundreds of different animals in lots of little makeshift stables. There are goats, sheep, all kinds of different fowl and, of course, the pigs. I got out of the car and called his name, no answer. I went up to the door of the house, but nobody was there. Finally, he responded. He was down in the field, in a little hut, outside a fire was burning with a big cauldron from which steam rose into the air. As I approached the hut I was aware of a smell of blood and fear. It was dark inside, my eyes needed some time to adjust before I saw what was around me. He had slaughtered six pigs already and was dismembering their bodies. For anybody this would have been a gruesome picture to look at, for a person who had never eaten meat, this was pure horror. I tried to see whether my piglet was among the dead, but their faces had been so badly disfigured by the bolt that punctures the skull and drills deeply into the brain, a practise done before the throats are cut to bleed them out, that I couldn’t see whether he was or not. I finally managed to tell the farmer what I had come for, that I wanted to buy of him the little piglet from Santa’s Village, but that I might have come too late. I was not, he was still alive, I had literally come just in the right moment, he would have been next. Pigs love their food, are true gourmets. Achille loves fresh food, crunchy vegetables, he loves to graze and root in the ground. His love for food makes it also quite easy to teach him new things. For the right kind of treat he might even walk on his hind legs, I suppose. But being the pig he is, he also loves to share. Often, when I bring him his basket of fruit and vegetables, I love to stay and watch him enjoy his meal. He is so clever with his lips, gently picks up one grape after another, even peels an orange - truly enjoying his repast. However, now and again he will walk up to me and bring me something to eat, a cabbage leave, half an apple, gently dropping the treat into my lap, looking into my eyes and giving me a friendly grunt. My car is tiny, definitely not big enough to load a pig into, but I needed to take him away immediately. The piglet was in a dark and tiny stable made of cement, no straw inside. His mother was next door. She is a sow of almost 600 pounds in this tiny stable. Her children are taken away from her much too soon. She needs to make three litters a year. She watches them grow, she watches them being taken to the hut, hears them screams in agony, smells the blood. Three times a year. The little piglet, too, he saw, heard and smelled everything. So far, there was no or very little joy in his life. Achille seems to have next to his real anatomy a sort of magic anatomy. There seems to be a type of bladder next to his heart, a vesica gaudium where joy drips into. And when the bladder is full, Achille explodes with joy, needing to dance and jump. For an outsider, there may be no obvious reason for that exuberant expression of happiness, for me, however, the most logical explanation is the overflowing joy-bladder. Having people in one’s life one can count on, is a great gift. I needed to act fast, the piglet needed to be taken away to safety. I needed a vehicle to transport the pig with and another pair of hands to help carry the cage. The pig was afraid and not used to be handled. And, even though still a piglet, he already weighed 120 pounds. Luckily friends live not too far away from the farmer’s and I called to borrow their pick-up, which they gladly lent me. I called another friend to give me a hand, he too was available immediately. The farmer wanted an awful lot of money, which I had not on me (nor did I have it I anywhere else, to tell the truth), but promised to pay in the next few days. When children come to the farm, Achille enjoys to play with them. Running in the fields, as fast as possible, around trees, hiding, running up the hill, using all the muscle power available until no energy is left, that is his favourite game. And there is nothing better after a crazy game of pig/kid-hunt than stretching out in the sun and cuddles. Mind you, the children enjoy it just like him. Achille truly likes company, he is a real Italian in that sense. Eating together, laughing and playing together, enjoying the good side of life in company of people you love - that is very Italian, indeed. We loaded the pig in its heavy iron cage onto the little pick-up and drove off towards home. Our hearts were beating fast, we were so very much aware of having saved a life here. The pig in its cage seemed to be aware of the change of fate as well, the fear and panic it showed earlier seemed to have passed. Not unlike a dog it stuck its snout out of the cage into the breeze, absorbing everything around - new scents of a new life. The ability to forget, push away or bury memories of excruciating pain is said to be something very human. Often I wonder how many of the atrocities Achille experienced are still in his memory. 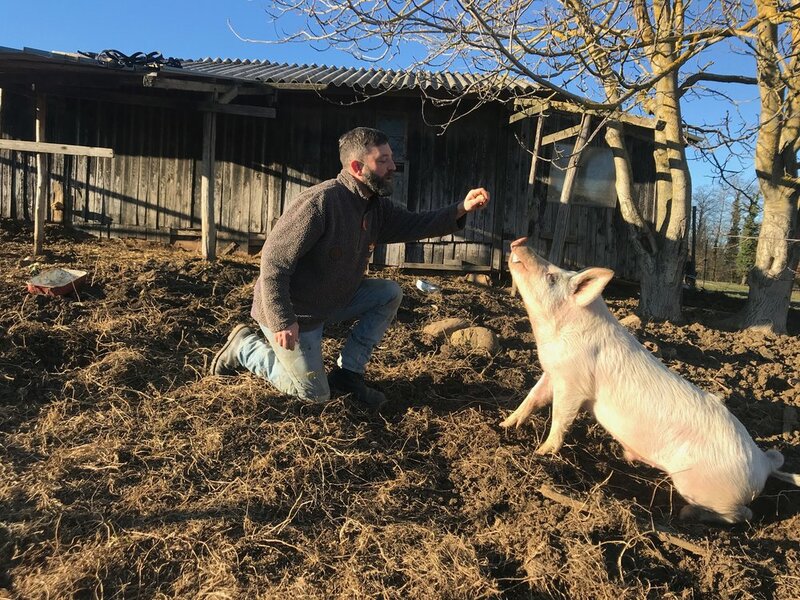 The farmer used to grab the pigs by the ear and tail, pushing his knee into their bellies to help lift 80kg and more when he needed to move them to another box. When he took them down to the hut where he slaughtered them, the pigs would squeal, scream in agony, in fear. They always know what is going to happen, they scream and beg for their lives, try to free themselves. Those animals were treated like objects, even worse perhaps. There is no empathy or respect for life. And these pigs are considered the lucky ones, those raised in industrial farms, which is how the majority of meat is produced, are even worse off. Their deaths are perhaps better organised, more efficient, but not less violent and cruel. And indeed, Achille does not like to be forced to do anything. Sometimes one’s own impatience collides with his wish to do something else. When I would like to return home quickly from a hike and he finds some acorns right in from of the house, naturally he would like to polish them off before returning to his paddock. I was so absorbed by my own plans, that I didn’t respect his and tried to force him back onto the path. He got upset, but not because he couldn’t eat his acorns, but because of me using force against him. It was so wrong and unnecessary, not a big deal, but enough to leave me upset about my own doing. Achille is such a gentle and most sensitive being and with all the horrors he has survived, he deserves love and respect in any situation. Now, with all the adrenalin gone, the weight of the cage and pig seemed so much heavier when we unloaded it. We took it to the paddock I had prepared and opened the door to let him out. He took his first steps onto the grass and into a future he originally had been denied. We could feel what he was feeling. He started to run and jump and for the first time, was not afraid of being touched by a human, actually enjoyed the contact and was ready for his very first belly rub. Achille loves belly rubs, especially after a meal, for him it is like desert; first some good food, then a belly rub and finish everything off with a little snooze in my lap. Eating meat, raising animals in atrocious conditions, killing them for our pleasure, is so utterly wrong. Getting to know Achille, his wonderful personality, his mind and spirit, has made me cry numerous times. Sometimes they were tears of joy, but most often they were tears of desperation due to all the horror we human beings inflict on other sentient beings for rather questionable reasons. Achille is a kind of ambassador; quite a few people who have met him where so inspired that they have stopped eating meat. Young children who come to play with Achille suddenly become aware of the horrible truth behind the consumption of meat. Nobody needs to lecture them on ethics, it is an insight they reach all by themselves. He is still a child our Achille, only eight months old, there is a wonderful life ahead of him (pigs can live up to 25 years of age) and a lot of work to inspire as many people as possible with his loving and generous nature. Achille has become a local celebrity, friends helped to collect the money I needed to pay for his life. At the end of this article, we are at the beginning of a wonderful story here. The sound of horses chewing is a vivid childhood memory. Often I would remain in the horse stable in the evening, just to enjoy the sound of the animals munching away on their hay. In the video, when you turn up the volume, you can hear that lovely sound; the donkeys peacefully chewing away on their oat straw. Even though donkeys don’t take well to nutrient dense feed, this straw is too poor to truly provide them with all the necessary nutrients. I try and make up for it by also providing them with olive branches and outings to pastures where still a little grass may be found. And here I am again, again asking for your help and support to get the animals through Winter. Asking for help is not an easy thing to do, but this year it really is necessary. To provide the animals with enough hay to eat and straw to keep them warm through the Winter, we need to raise an amount of Euro 2.300,-. Under “Support Us” you’ll find an easy and quick way to make a donation. Thank you very much, indeed. Join our communal bid to do better. Mostly everyone knows about Black Friday, that is to say, the day after the US feast of Thanksgiving which is regarded as the first day of christmas shoppping. We even have Black Friday here in Italy; Chiusi, a nearby town (in Tuscany) had its own Black Friday sale. Cross cultural fertilisation is a rich tapestry yet it seems that in this case, we have succumbed to an endless entreaty and enticement to buy more and more things. Arguably, these are mostly things we do not need. Who's to say? We are to say! But are we able to do so, given the increasingly disconnected, distracted, on-line, stressed out lives we lead? Stress makes us liable to make impulsive choices we later regret. Not to worry, throw away the things - or hoard them somewhere - and buy more things! This cycle damages the planet. It also damages our relationships to others and to the world community at large. For those of you who haven't yet had a chance to see "The True Cost" film we urge you to see it; or if you have seen it, watch it again. The main message about the perils of consumerism and fast fashion applies to other forms of industry and how we live our lives. Its message is universal. And it is unequivocal. We must act. We must engage. Show up for your own lives as well as the lives of all others. Today is Giving Tuesday, a day of giving, of donating time, or money or goods. A day to reach out and engage in your glocal community. Help us at Campogrande to help you to curate this beautiful, one time only, exhibition of a planet. Help us to encourage all of us to be better caretakers. Join us by making a donation (small, medium or large!). Join our communal bid to do better. Because we are capable of so much more than being mere consumers. It is so easy to become overwhelmed by the reality of climate change. The more we learn about it, the more we observe and experience it in our own communities not to mention in the global community as a whole, the more we also risk remaining paralysed in a state of helpless anxiety. At Campogrande, we are dedicated to educating people to engage with climate change in a proactive way. We urge everyone to make informed choices about the way we live our day to day lives whilst being sensitive to the longer term impact on the planet. We have also found that by working on the farm and by taking care of the donkeys in particular, we are forced to be present in this here and this now. The donkeys are part of our purpose. They show us how to participate, to engage, to be present. This also fosters community both in real time (visitors) and with our on-line community of friends and supporters. Who knows, maybe a classroom of inner city children would like to learn about donkeys. E.g a year in the life of a donkey and thereby learn about eco-systems, another species, and also the sheer fun that donkeys provide e.g write a day’s diary entry as though you were a donkey..! Join us in being proactive about climate change and about learning about the beautiful bio-diversity of this planet of ours which is currently under threat. Make this donation participatory, designed to avoiding climate change inertia. And perhaps in so doing, you will start to notice other causes in your local community which align with these values and which you could commit to through donations or by volunteering time. Transform the anxiety generated by the challenges of climate change into a cause you believe in. Make it your purpose to do so. And if we have inspired you to do so, we'd love to hear from you. And to all you teachers out there, if you would like to create a writing project using our donkeys for inspiration, let us know! In order to be able to continue to inspire, we need your help; especially this Winter. Under “Support Us” you’ll find a quick and easy way to make a donation. Thank you very much, indeed, any help is needed and most welcome. When we harvest our olives, we also prune some of the trees. We give some of these branches (once we have removed the olives of course!) to the donkeys to eat. (Think of it as a cycle of nature). The other day, after we had laid out a feast of olive branches for the whole family of donkeys, we realised that one of our younger members was missing. We quickly located her and enticed her back with promises of a special "Donkey High Tea", so to speak. We added that it was all very well to run away but preferably not before tea time, and perhaps best to avoid doing so during the olive harvest when special treats were on the menu. To keep this donkey paradise alive, we need your help; especially this Winter. Under “Support Us” you’ll find a quick and easy way to make a donation. Thank you very much, indeed, any help is needed and most welcome. Many people don't know that if donkeys eat too much fresh grass, they are in danger of developing high sugar levels which may cause a condition called laminitis, an extremely painful inflammation which affects their hooves and may be lethal. We are only now starting to realise the impact of high sugar levels in human beings which can lead to diabetes, obesity, heart disease and other inflammatory diseases. Indeed, the statistics are shocking and reveal the need to address this head on. At Campogrande, we ensure that our donkeys have a good, balanced, diet and that their sugar levels are kept in check, and in so doing, we are reminded of the need to do the same regarding our own diets, a lesson we share with all of our visitors and friends (check out our delicious recipes!). By looking after the nutritional needs of our donkeys, we are also (re) learning to do the same regarding our own diets. As the saying goes, "All good things in moderation!" Under the menu “Support Us” you’ll find an easy and quick way to make a donation directly online. Thank you to being a counterweight to Black Friday and supporting us on our countdown to Giving Tuesday. HUG A DONKEY! Donkeys are not only intelligent but they are also highly attuned to others. They are therapeutic to be around, (indeed, an entire branch of therapy has been developed with donkeys) and are great for kids (young and old!) to learn about the dynamics of non-verbal interaction and a great way to entice them away from their screens. Hanging out (and hugging!) donkeys is a great way to develop communication skills which can strengthen connection, empathy and community. Visitors to Campogrande who have had a chance to spend some time with our donkeys have spoken about an amazing, unforgettable experience and have come away transformed. During the holidays school children in summer camp come to the farm to learn about nature and connect with the animals. Help us share this transformational experience as a gift to our donkeys, to all those who wish to visit us and to meet the donkeys and to strengthening the connection and community of humanity as a whole. Holistic Empathy for nature and Holistic empowerment & engagement to nurture (education) -transferable skills that are overarching about how we nurture nature. Traffic accidents happen in the countryside just like they do in the city. Last night the wild board drove into the living quarters of the bees. Donate to our Winter Aid Campaign which will help us look after all of our family of animals at Campogrande and will also contribute to a healthy eco-system and biodiversity. The first frosts in the morning are a harbinger of Autumn changing into Winter. We still have not finished the olive harvest, but a spell of rainy days keeps us locked up in the house. Our little sanctuary has 17 donkeys now and maintaining so many animals is starting to become a very challenging activity, mainly for financial reasons. In eleven years we managed to have everybody fed in happy more or less by ourselves; now, however, we face some rather big projects where we desperately need to raise funds. For this Winter we urgently need a new and bigger stable to keep all animals dry and warm. 17 donkeys need quite a lot of hay and straw during the Winter. And as not to let them procreate, we have to castrate seven stallions, which amounts to Euros 2500,-, which is however the smallest sum needed. We are asking for your help. Please help us to keep the animals safe and healthy and allow us to provide a home for other animals in need. On the website, under “Support us” you’ll find a button “DONATE”, which allows to make a donation comfortably through PayPal. If you choose to donate directly through a bank transfer, contact us via e-mail. It may be a good counterweight to Black Friday’s spending craze. Thank you for your help, it is desperately needed. Farm life is always busy, there is constantly so much to do, mostly more than two hands can actually accomplish. The grounds, the animals, the veg garden and, of course the herb pharmacy and the production of cosmetics require a lot of dedication and time. Than I feel a strong responsibility towards the community I live in; to have a functioning society one must take an active part its wellbeing. Voluntary work is one of my ways to give something back to a community that has provided me with a home; I am on regular shifts doing ambulance duty. Than there is family, the wish to build something up together, seeing a project thrive and to provide for the future. An enormous amount of energy is required for all this. But where does it come from, what is the source of inspiration? I believe it is gratitude. I am so thankful for all the wonderful things happening in my life, for all the fantastic people who are part of my life - in gratitude I feel love. And right now the feeling of gratitude is almost overwhelming, thank you. However, so is sleepiness and the need to rest the body. It’s been more than three months now, that I’ve been fasting. Well, no, it may feel like it, but it has only been nine days. Yes, the first three /four days were, as always, difficult: fatigue, headaches etc. But then everything was fine, I felt great, light and full of energy - until yesterday… my thoughts were all about food. I could only think of all the lovely dishes I wanted to prepare and working in the veg garden was pure torture: ripe strawberries, fave beans, deliciously smelling herbs. The thought of taking a bite of something green, fresh and crunchy was more than sweet, I was longing for the feeling to chew and swallow. Fasting is something I do regularly to give my body a sort of reset. When I am preparing for something new, when I need clarity in my mind or when a different sort of energy is required for healing work. Well, this time I am missing the aspect of focus a little and I am observing myself behaving like a teenager. Mind you, I am still on the fast, lets see where it might lead to. Food is our first medicine and it truly is able to perform miracles (and disasters if the wrong type and too much of it is consumed). However, what people consider to be food, has changed drastically in accordance with the desires of a rather superfluous industry. Rule of thumb: be hesitant of foods that come in packaging, when food is a product sporting ingredients and perhaps an advertisement - it is not food anymore. Highly processed and refined foods are dead. Try to look at food like your great-grandmother, anything she would not have used or known is probably wise to refrain from. Preparing fresh food from scratch surely is the healthiest way for your body, community and the planet. If you cannot grow your own, buying your groceries at a farmers market or directly at a farm is possible even in the biggest cities of our planet. Like this you support directly local farmers without giving money to big corporations, get fresher and truly ripe produce. I strongly advocate a 100% plant based diet, 51% of which should even be raw food. And now I am telling you to go for the ugly and damaged veg as well. Because plants talk, they communicate with each other and also with insects by the means of so called plant volatiles, a phytochemical released normally in small amounts in the leaves. When a leaf is damaged by herbivorous insects, many more plant volatiles are released. Exactly which plant volatiles are produced varies both by the plant species and by the species of insect eating it. But why do plants do this? Well, these volatiles attract both parasitic and predatory insects that are natural enemies of the herbivore insects eating the plant, it is the plant's way of recruiting help to defend itself. The plant attracts other insects that like to eat the very insects that are eating its leaves. Plant volatiles can even signal to neighboring plants to increase their defense responses too. Plant volatiles are known to have very strong anti-cancer and antioxidant properties - meaning, it boosts our health to eat them and protects our cells; we’re getting more antioxidant goodness when consuming those organically-grown leafy greens that have some insect holes in them. And most probably you can even buy them cheaper. Enjoy your food, I will have to wait for another week, but will surprise you with some dead easy and nutritious recipes then. My blog entries will vary, sometimes they will be some concrete writings on plants, a sustainable lifestyle, maybe building, the Campogrande Agricosmetics or whatever thought occupied me during the day and I feel valuable to share with you. Like this my readers get to know Campogrande in a truly organic way. Do you have some favorite items, things you care for and do not want to part with? I have lots! In fact, I try to have only those. Things that are of high quality, things that can be repaired, mended or given new life with a different use. My car is already 50 years old and can basically be mended with a screw driver. I did so just yesterday. It does not have a catalytic converter and no electronics that regulate the exhaust fumes. But it uses very little petrol and ran for all these years without producing waste. Only a car that has never been built may be called environmentally friendly. Considering that the average lifetime of a car in Europe is 9.65 years, calculating the grey energy of producing a car that is certified as eco friendly - I must say my trusted Fiat 500 is doing very well in comparison. The idea of discarding something because it is faulty and replace it with a new item, has become very foreign to me since I moved out here in the green heart of Italy. In the beginning it was just an idea, which went along with the concept of a sustainable lifestyle. It made sense. But then something magical happened and it became love. There is such great beauty in maintenance, in caring, it opens up a completely new world. Many things have to be learned first, not as in acquiring a new taste, more as in knowing something from the roots up; like this, one develops a passion for caring and a wonderful ability to use one’s hands, to create and renew life. It may be a broken branch from a plant that is mended to heal or potted to grow new roots; an old, metal watering can that can be soldered to give it many more years of life - love comes with knowing, caring and creating. Isn’t this already a big slice of what life is about? To use the notion of mindfulness has become very fashionable, there are millions of coaches offering workshops on the theme. You learn to walk in a mindful manner, speak or eat - I am sure their are workshops on many actions you can pay money for and learn in four days how to do them in a mindful fashion. Sometimes I find these ideas rather foreign and abstract, why not adapt them to everything you do and just call it your life? Nine years ago I chose to live a life I would not need a holiday from. And truly I haven’t seen the need for one. My mind and my heart are so full, inspired by the contact with nature, giving birth to so many ideas - often I wonder how much time will be left to transform all of them into reality. Life is so short and for many years I was not following what my heart truly desired. No regrets here, but just such an incredible love for life and to create and grow.